Author Written by Cleo Isco and last updated on Posted on March 15, 2016 . Posted in Categories SAP Certification FAQ. An SAP implementation is a large scale, multi-month (or year) project that requires a “methodology” to help organizations successfully execute an SAP implementation and maximize the use of SAP’s functionality after go-live. A detailed description about each of these phases is given below. In this phase you create a blueprint using the Question & Answer database (Q&Adb), which documents your enterprise’s requirements and establishes how your business processes and organizational structure are to be represented in the SAP System. You also refine the original project goals and objectives and revise the overall project schedule in this phase. SAP has defined a business blueprint phase to help extract relevant information about your company that is necessary for implementation. These blueprints are in the form of questionnaires that are designed to probe for information that uncovers how your company does business. As such, they also serve to document the implementation. Each business blueprint document essentially outlines your future business processes and business requirements. The Realization phase is broken in to two parts. Your SAP consulting team helps you configure your baseline system, called the baseline configuration. Your implementation project team fine-tunes that system to meet all your business and process requirements as part of the fine tuning configuration. In this phase you complete your preparations, including testing, end user training, system management, and cutover activities. All open issues in this phase must also be resolved in this phase. At this stage you need to ensure that all the prerequisites for your system to go live have been fulfilled. As phase 3 merges into phase 4, you should find yourselves not only in the midst of SAP training, but also in the midst of rigorous functional and stress testing. Phase 4 also concentrates on the fine tuning of your configuration before Go-live and more importantly, the migration of data from your old system or systems to SAP. Workload testing (including peak volume, daily load, and other forms of stress testing), and integration or functional testing are conducted to ensure the accuracy of your data and the stability of your SAP system. Because you should have begun testing back in phase 2, you do not have too far to go until Go-live. Now is an important time to perform preventative maintenance checks to ensure optimal performance at your SAP system. At the conclusion of phase 4, take time to plan and document a Go-live strategy. Preparation for Go-live means preparing for your end-users questions as they start actively working on the new SAP system. In this phase, you move from a pre-production environment to the live system. The most important elements include setting up production support, monitoring system transactions, and optimizing overall system performance. The Go-live milestone is itself is easy to achieve; a smooth and uneventful Go-live is another matter altogether. Preparation is the key, including attention to what-if scenarios related not only to the individual business processes deployed but also to the functioning of technology underpinning these business processes and preparation for ongoing support, including maintenance contracts and documented processes and procedures are essential. 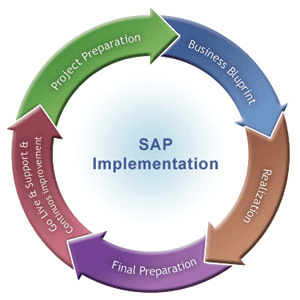 These are the phases of SAP implementation. Please let get in touch with us through comments below if you have any questions! Thanks for nice feedback! Can you please provide more details? Valuable explanation on ASAP Methodology…could you please help me out to get an Entry Level Project ? good for enterprise systems and the industry in general. Pingback: SAP Fiori - What Is SAP Fiori and How to Prepare For It? Pingback: SAP Remote Jobs - Do They Exist and How to Find Them? Previous Previous post: We Are Giving Away Money!